Celebrating the launch of Leyla McCalla’s debut album, Vari-Colored Songs: A Tribute to Langston Hughes, HCX collaborated with BRIC’s Stoop Series, to co-present An n’ Pale|Café Conversations. To a packed house of over 150 people, Leyla regaled the audience with renditions of Haitian folk songs such as Mèsi Bondye, Manman Mwen & Latibonit as well as arrangements based on Hughes’ poems. Leyla’s music is a blend of Haitian and New Orleans folk music coupled with her distinct vocals and noted talent on the cello. Following the inspired performance, Leyla and HCX Executive Director, Régine M. Roumain, discussed McCalla’s current tour, experiences abroad, her upbringing, and the work that went into creating her first album. When asked about research for the album, Leyla mentioned listening to Alan Lomax’s recordings, a 10 disc and two book boxed set collected during his 1936-37 trek through Haiti, and meeting with her parents to discuss songs, their meaning, and working with her father to translate the songs from Haitian Creole. 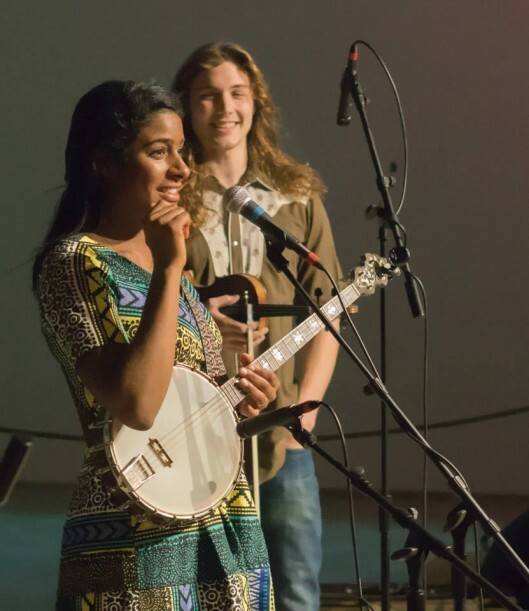 Currently residing in New Orleans, Leyla continues to be inspired by the music of the region and collaborates with local musicians to create her unique sound. A rising young artist on the scene, Leyla is becoming increasingly well known as her work continues to receive outstanding reviews. We are thrilled to have been a part of this evening! Take a look at some photos from the conversation & performance here. Purchase McCalla’s debut album, Vari-Colored Songs: A Tribute to Langston Hughes, can be purchased here. This An n’ Pale | Café Conversation took place on February 11, 2014 at BRIC in Brooklyn. This entry was posted on Friday, February 28th, 2014 at 6:29 pm	and is filed under An n' Pale, Archive, Arts, Events, HCX Collaborations, HCX Programs, Music, Public Forums. You can follow any responses to this entry through the RSS 2.0 feed. You can leave a response, or trackback from your own site.